The long history of Blueberry goes back to the 1970’s when American breeder DJ Short was working with different exotic landrace strains in California and Oregon. This legendary breeder worked together with a number of different seed banks, so genetics were passed around and everybody had a shot to make something out of it. It was at the High Times Cannabis Cup 2000 when Blueberry finally got what it deserves: 1st Prize for BEST INDICA! Zambeza’s Blueberry is enriched with genetics of Northern Lights, another legendary strain from the West Coast. Growers can expect plants that stay compact and bushy, with typical indoor heights of 60-90cm. Indoor growers will have the fair chance to achieve yields of 350-400g/m². Outdoor growers will have to find a way to deal with plants that are 170-230cm tall, and yield 400-500g per plant. The flowering time is short, with approximately 60 days. The effect of Blueberry is a heavy Indica stone that is physically relaxing, meaning that a gentle and pleasant body buzz can be felt after smoking. Zambeza’s Northern Lights XL did a great job in contributing to the potency and aroma. THC levels were tested at 19%. Taste and aromas are predominantly sweet, with noticeable hints of fresh blueberries. This remarkable taste and the unique “Blueberry-high” made this strain an international success and it's still a very popular choice today. Blueberry became the “gold standard” of North American cannabis strains and is now available as a refined version, with genetics of Zambeza’s Northern Lights. 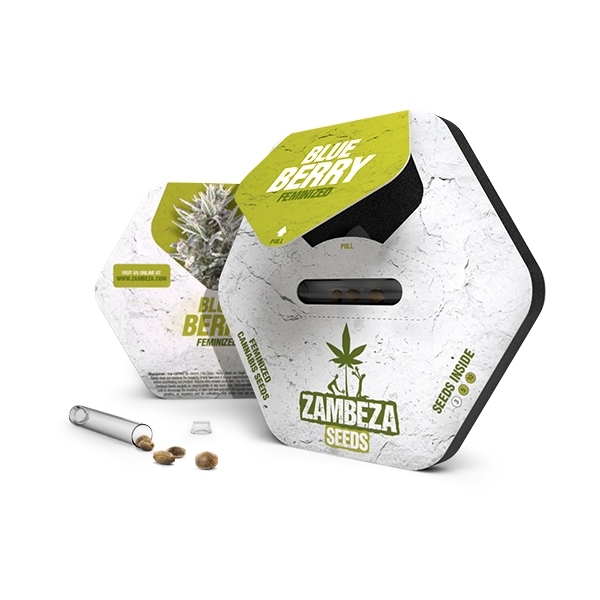 When growers want to cultivate an indica-dominant strain, with sweet blueberry flavours, and a strong physical stone, then its Zambeza’s Blueberry they should go for. It’s one of the most appreciated strains of cannabis history!